Thank you everyone for coming out on a beautiful fall day and spending it inside listening to stories together. I always get worried when the sun comes out that people will run out of their homes with their arms upraised and completely forget about the show that night. Thank you for showing me how wrong I can be! It was nice to have a bunch of first-timers in the show again and I hope they all come back. We had too many stories to me to mention individually but one of my favorite memories of the night is the image of first-timer Ana trying to explain to her mom the “scale of sexual fluidity.” I assusme it’s not quite as complicated as explaining how email works to my grandma but it’s gotta be close. Congratulations on making it through that one Ana. Kenji told us about his first kiss and how it received an ovation from a room full of strangers. Lauren told a beautiful story about how dangerous and also heartbreaking it is to be a teacher. And Jake, one of our old-timers, came up with my new favorite line to describe the perfect relationship, “I just wanted someone to roll eyes together with.” I have to admit, even between two strangers, rolling your eyes together at the same thing is a pretty tight bond. Thanks to all the tellers who got onstage last night: Ana, Stephanie, Brenna, Bill, Kristi, Dave, Carl, Jake, Chris S, Tracey, Manasa, Chris M, Lauren, Gus, Barb, Kenji, Paul D, Lynn, David, and Kat. This show has surpassed every expectation I’ve ever had for it and I am incredibly grateful to everyone who has supported us over the last six years. As long as people keep wanting to share stories I’ll keep showing up with a couple of speakers and microphone. I do need to change things around a bit because we’re getting so many people throwing their name in Mr. Coffee. The show is only supposed to be 90 minutes long and the last couple of months I’ve been letting it go well over two hours in order to give everyone a chance to tell. Unfortunately, I can’t do that anymore. Two-to-two-and-a-half hours is just too long for a show like this and it’s not fair to ask a teller to get up there when the audience is that tired. There’s a big energy dip around the 90-100 minute mark so I’m going to have to keep the show to that length from now on. The problem, of course, is what to do when 20 people throw their name in Mr. Coffee and we only have time for 10-12. It’s going to take me a while to figure out the best way to do this but for now I’m going to try to focus on giving preference to two specific groups of tellers: first-timers and regulars who have spent a lot of time crafting and practicing their stories. I’ve always gone out of my way to make sure first-timers get a chance to tell because I know how hard it is to build up the courage to walk up there for the very first time. I don’t want to turn them away because of time constraints when I know they’ve been nervously preparing all month. I decided to give the tellers who have been really working hard on their stories preference as well. Obviously I’m not in contact with everyone and can’t tell for sure how seriously they’re working on their story but I do get lots of calls and emails from people asking me questions about a story they’re working on or letting me know in some way that they’re practicing on friends, co-workers, family members, etc. I want to respect the work those guys are putting into their craft so if I know you’re really bearing down and working on a story you care about I’m going to do what I can to get you a spot in the show. I know this isn’t a perfect solution and I’m sure it’ll change over time as I try to balance the open-mikey-ness of the show with my desire to give time to the people who need a place to work on their craft. If anyone has ideas on how I can semi-curate the show while still welcoming people who have never spoken in public before send me an email. You know how hard it is for me to bump people when we run out of time but I have to figure out something so stay with me until I find a good solution. In the meantime, I want to let you know that there is another free storytelling open mic and it’s run by some really sweet people. 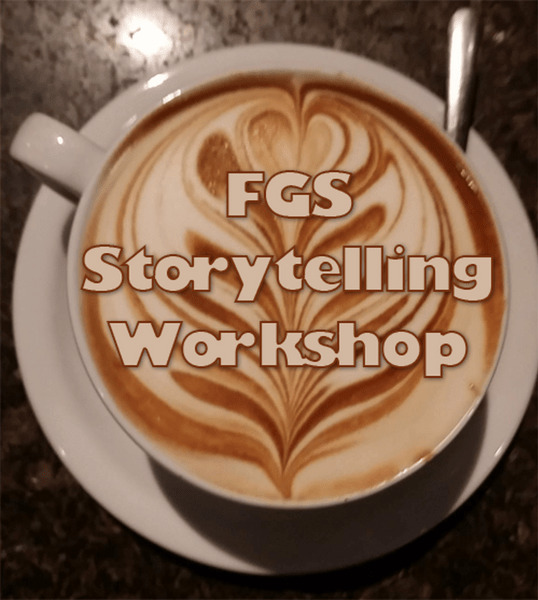 The Seattle Storytellers Guild always has an open mic after their regular monthly show and they would love for people from FGS to come tell some stories. Before the open mic is a featured teller who usually does 30-45 minutes of various kinds of stories. I love performing at SSG and you guys will too. Last year they let me do an hour of personal stories and a few months after that they asked three of our regulars to each do a 20 minute story. They’ve been really good to us and I would love for all of you to check them out. It’s a great place to tell your story if I can’t get you on at our show that month. Another great place to tell is A Guide To Visitors. It’s not an open mic (you have to email them a quick summary of the story you want to tell) but it’s always a fun show. They were the first people I ever told a story for and I’ve been performing there ever since. They use a lot of FGS tellers in their show and it’s one of the few places in town where you can tell stories in the 10-20 minute range. That’s all you’ll hear from me until the invite from the next show goes out sometime next week. Our next show will be Thursday, October 27. The theme is “Called to Action: Stories of being compelled to do something”. Hopefully, I’ll have catchier title by the time I send out the invitation.